Travel Guide Part II: Ella’s Paradise. After our early morning safari in Udawalawe national park we jumped into a cab to Ella. There are quite some tourists travelling between those two destination, so if you’re lucky you can make a deal with a cab who’s driving from Ella to Udawalawe because of tourists travelling to Udawalawe. Since he is already driving back with or without you, you can make a good deal and get to Ella for a cheap amount. In less than three hours we arrived in Ella and we were immediately in love with this green and mountainous area! Ella is centred in the mountains and therefore a little bit colder, so be prepared! Ella is cute, it’s basically one street where some bars, cafes and shops are centred. People end up staying very long in Ella because there is so much to do in the area! Our favourite restaurant for breakfast AND dinner was definitely Ella Village! Everything is so fresh and the owner is so nice. If you finish a curry he will just bring you more for free! During our stay in Ella we stayed in two different hostels. The first hostel was recommended by other travellers we’ve met on the way: Tomorrow Land. It’s a bit out of town, but the location is beautiful. It’s in the mountains and you have a beautiful view, especially around sunset. The opinions of this hostel were a bit divided. This hostel is definitely built with the goal to party a lot and create the festival vibe (Tomorrow Land is a festival in Belgium). The hostel has a big hippie vibe with couches everywhere and you sleep on mattresses on the ground all next to each other and in the same space as the party area. The other option is to sleep in a tent outside. We were there in low season so there was almost no one here, in high season you won’t sleep and there will be party’s every night. I definitely liked the experience of this festival vibe hostel. We decided to change to Hangover hostel after two nights because that was a bit more luxurious and in the heart of Ella. As I said before, the reason Ella is so amazing is because there is so much to do! One of the most famous things to do here is to visit the Nine Arch Bridge. The bridge was built in 1921, during the British Colonial Period. It’s a beautiful walk itself to the bridge, where you can walk over the train track and enjoy Ella’s green surroundings. The interesting thing about this bridge is that when they built it they only used bricks. What they didn’t use was steel or metal to support the construction! At the bridge there is a cute old Sri Lankan man where you can get a fresh coconut while you watch the train go by. There are multiple mountains where you can hike to the top around Ella. The two most famous ones are Ella’s Rock and Little Adam’s Peak. We decided not to climb Ella’s Rock because we heard stories of local people pointing you to the wrong direction only because they can come and rescue you later for money. If you plan the hike beforehand really well and know where you going, everything will be fine as long you won’t listen to the locals telling you you’re going the wrong way. We did decide to hike to Little Adam’s Peak (1141 m in height). Little Adam’s Peak is named after the big and sacred Adam’s Peak because in appearance they look like each other. It’s an easy 20 to 30 minute hike to the top of Little Adam’s Peak where you can enjoy a 360 degrees panoramic view. Once at the top you can decide to climb a bit further and explore some viewpoints at the peaks around it. There is a little Buddha statue which adds to the beauty of this spot. 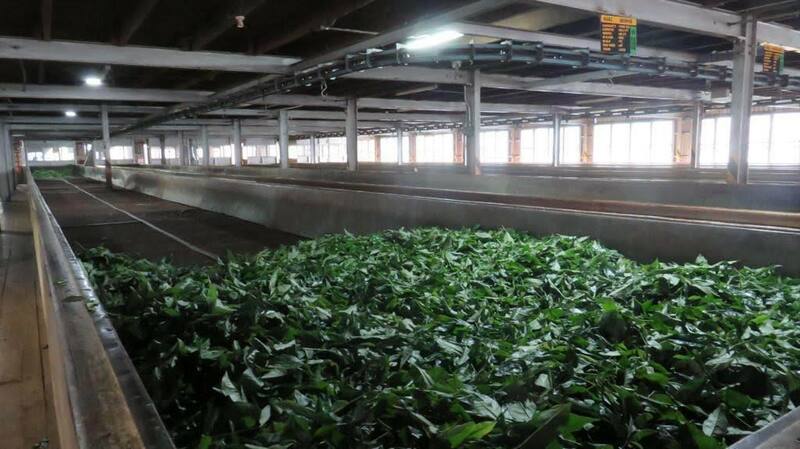 Ella is famous for her beautiful tea fields and plantations. Back in the British Colonial time the British people tried to grow coffee in this area. This failed miserably, so they decided to try to grow tea instead. With success! Simply walk around in the area of Ella and you’ll find the fields in combination with beautiful mountain views. If you want to take a close up photo of one of the women in the fields you have to pay them a little bit of money. There are multiple tea plantations you can visit around Ella. When we were there the green tea factory was closed, so we decided to travel a little bit outside of Ella to visit the black tea factory: Uva Halpewatte. You have to pay a little entrance fee and that will give you a short introduction about all the black teas in Sri Lanka, a tour to the factory and a tasting in the end. 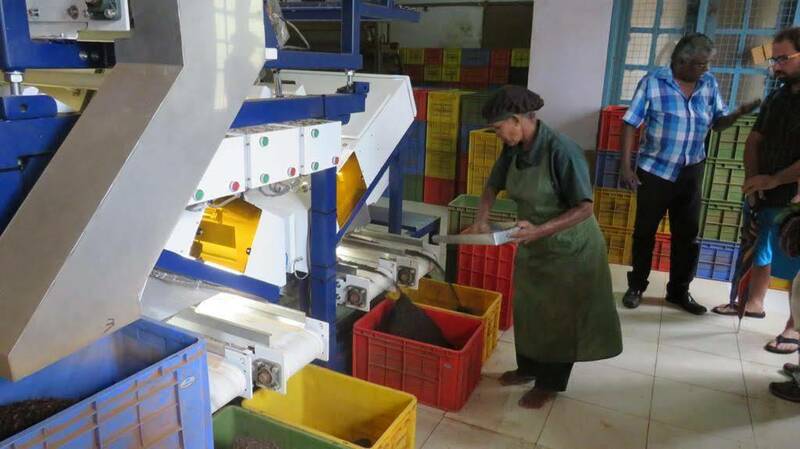 What surprised me the most was that there are only women working in the factory and they are all working barefoot! That’s something else than the safety standards in the factory’s in the Western world. 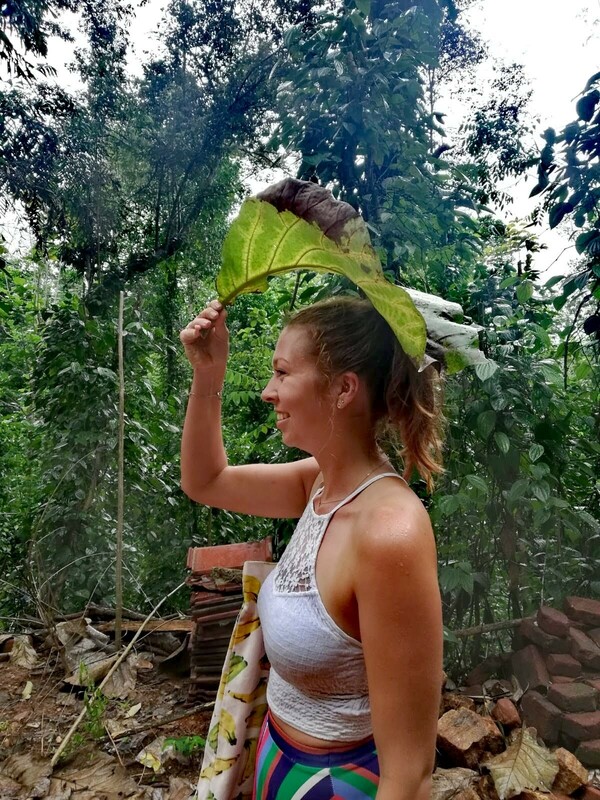 It’s an interesting tour which I would highly recommend since you learn a bit more about the Sri Lankan culture. Around Ella town you can find a lot of waterfalls. We tried to find the secret waterfall twice without success (it truly is a secret waterfall), so we decided to visit another one. At Hangover Hostel worked a local who recommended us one. We jumped into a jeep and drove about an hour. 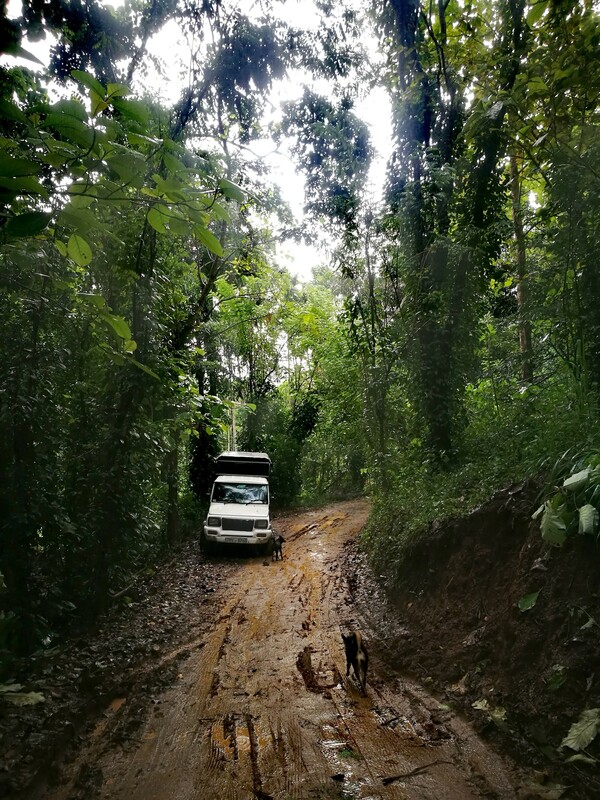 It was a rainy day and the last part was a muddy road to the jungle which added to the experience! We walked for about twenty minutes when we arrived at the waterfall. There was absolutely no one there! We took a shower under the powerful waterfall and found shelter from the rain at a family living close to the waterfall. Apparently in high season you are also able to go camping in this area, if you ask me an absolute must do! As I shared with you in the first part of my travel guide to Sri Lanka (read about it here), most travellers decide to travel from Kandy to Ella and from there to the beaches of Sri Lanka. We decided to do it the other way around and for that reason we had plenty of seating space. For almost nothing you can buy a train ticket at the station of Ella. We decided not to go all the way to Kandy in one way, because we wanted to climb the sacred Adam’s Peak close to Hatton. The train ride is incredible! The views are breathtaking, from foggy jungles to the beautiful tea fields around Nuwara Eliya (a place where a lot of backpackers make a stop as well). From Ella to Hatton it took us around five hours, the train drives very slow because of the old tracks and the jungle around it. We loved this because you can enjoy all the surroundings around you. Sometimes we sat in the open doors and that felt like ultimate freedom. In my third part of my Sri Lanka guide I will write about the last part of my time in Sri Lanka: the amazing hike to Adam’s Peak, the vibrant city Kandy, the incredible sunrise at Sigiriya (Lion Rock) and another beautiful beach experience, including spotting over 2000 dolphins, in Trincomalee. Soon online!